This animation of ninjas unboxing a Nexus One by Patrick Boivin is fabulous! See more of Patrick’s animations here. Thanks for the video link Cali! Here’s a photo I took over my holiday break. I ran into a friend/Google Employee who had the lovely Nexus One. 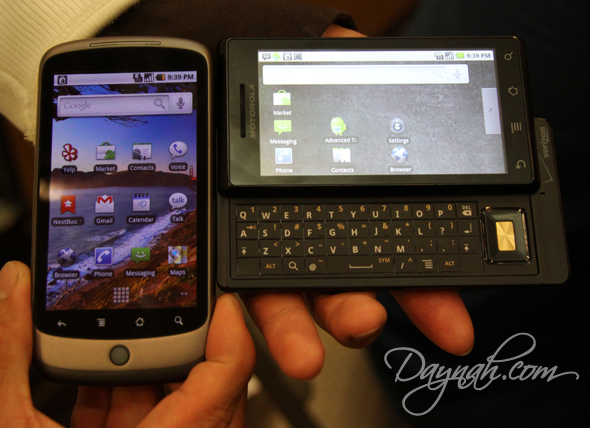 The Nexus One is on the left, and the Droid is on the right side. Hardware-wise, Nexus One doesn’t have a slide-out keyboard. Nexus One is only available on the T-Mobile network now, unless you buy an unlocked phone, whereas the Droid is on Verizon. The Nexus One is much lighter. For more information about Google’s Nexus One phone, see their official website and check out DroidDoes.com for more information about the Droid..
Half of my day consisted of reading your tweets and reviewing apps and gadgets. It’s been quite productive. :) Pictured above is the Motorola Droid, running on the 2.0.1, and the free Google Maps Navigation service. This service alone is worth getting the phone. The turn-by-turn voice navigation is quite awesome. :) Stay tuned, a full review of the Droid to come soon! I’ve been asking for a Nokia with a QWERTY keyboard… and they came out with one!! 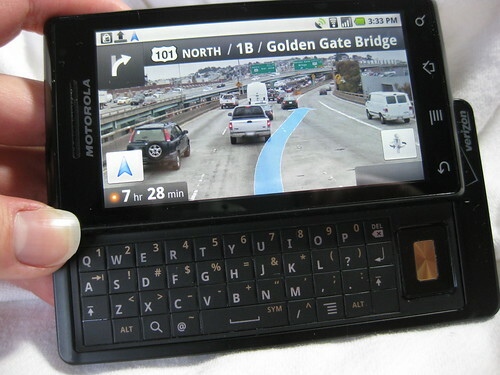 Here’s a video review of the Nokia E71 from Engadget. I got a lovely surprise today! My Nokia N95 8GB arrived this morning. I wasn’t even expecting it to arrive until next month. And I can’t seem to get the smile off my face today! So here’s the cute little thing. I’ve always liked Nokia phones, ever since I got my first one. It seems to be the only one where the battery lasts at least 3 days without charging. I have had other phones whose batteries stop working after a few hours! I changed phones a few months ago and was disappointed that Nokia Smartphones weren’t available with my carrier.